Emerging market currencies are getting slammed by the collapse in commodity prices, a downturn that has accelerated in recent weeks. The health of many middle-income and emerging market economies has been predicated on relatively strong commodity prices. A whole category of countries achieved strong growth by exporting their natural resources. For example, Brazil’s impressive economic expansion since the early 2000s, and the huge number of people that were able to jump into the middle class, was made possible by exporting oil, soy, iron ore, beef, and a variety of other resources. High prices for these goods led to more growth, a strengthening of the currency, and a real estate boom in cities like Rio de Janeiro. The same story unfolded in many other commodity-driven economies, from Latin America, to Africa, to Central and Southeast Asia. In fact, the fall of Brent crude below $50 per barrel has sparked a sudden downturn in emerging market currencies across the globe. But it isn’t just oil prices slamming currencies. The worries over the Chinese economy, including the plunge in its main stock market this summer, have raised concerns about the vigor of emerging market economies. Worse yet, China’s surprise devaluation has sent shock waves through currency markets around the world. Other countries now feel pressure to let their currencies depreciate, and if they have adhered to a currency peg up until now, some are being pushed to float. 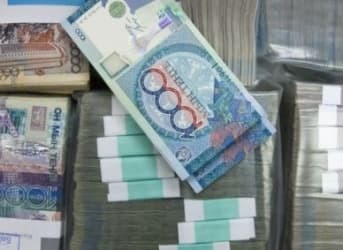 Kazakhstan decided to scrap its currency peg last week, and the tenge promptly lost 23 percent of its value against the dollar. Vietnam also devalued the dong. The devaluations tend to have a cascading effect, with other emerging markets coming under increasing pressure from their competitors. Related: Fresh Sell Off For Oil. Bear Market Here To Stay? Russia’s ruble fared worse following the move by Kazakhstan to float its currency. It is now at its lowest level in six months, and could soon blow through the record low seen earlier this year when Russia suffered a brief currency crisis. Unfortunately for Moscow, the run on the currency comes on top of brewing fiscal problems, as the budget deficit has ballooned to its largest level since 2010, following the financial crisis. However, Kazakhstan’s decision to float the tenge made sense given China’s devaluation and Russia’s own action to allow the ruble to lose value over the last year. Kazakhstan was seeking competitiveness for its economy. But one devaluation begets another. A lot of uncertainty reigns for emerging market currencies. All eyes are on Washington for what comes next. The Federal Reserve is weighing an increase in interest rates for the first time in years, a milestone as the central bank seeks to (slightly) withdraw its heavy hand in the U.S. economy. However, an increase in interest rates would strengthen the dollar. That would make the currency problems in emerging markets worse, both from the comparative devaluation against the dollar and from a potential further weakening in commodity prices. The global concerns could convince Janet Yellen to wait. Saudi Arabia and Qatar are building oil and gas pipelines through Syria to supply Europe. The sooner Russia gets out of the way the sooner Russians can begin eating again. Russians invaded Ukraine after holodomor. Eighty eight years later many Russians consider Ukraine their home. Other Russians consider Ukraine part of Russia. Six hundred million NATO citizens, plus the citizens of Lithuania, Latvia, Estonia, Poland, Romania, Modova, Georgia, Chech Republic, Slovenia, Hungary, Austria, and 40 million angry Ukrainians say Russians are dead wrong. Seven hundred thousand well educated and talented Russians leave every year for good jobs in the West. The exodus began fifteen years ago and continues. The loss from a population of only 120 million is extraordinary. What's left of Russia is old women, and the dross. I saw a photo of Putin reviewing a parade. Every soldier in the picture was shorter than Putin. Hollande, Merkel, and Putin are the same height. Russia is not a pretty picture. Half the Russian Navy is rusted out and won't float. Why does a country without a navy need to invade Crimea? Falling oil prices and a worthless ruble are part of the Russian war. Saudis are determined to over supply the oil market until Putin leaves Syria. The Federal Reserve currency trading desk devalues the ruble at a steady pace of 10 rubles/month until Putin leaves Ukraine and Syria. Ten is a nice round number. Russian oligarchs repatriated their profits between February and June this year. They bought rubles below 70 rubles/dollar. The trend line extrapolates to 140 rubles/dollar in February 2016. Rubles are a bad investment until Russia leaves Ukraine. Russia is a bad investment until Russia leaves Ukraine. After Russia leaves Ukraine the price of oil may return to $30/bbl. Perhaps not. The earth's core is made of iron carbide. The carbon supply is practically endless. Human imagination is the only limit on the supply of cheap oil. included Krimea into Ukraine as well !